These observations are simply that: my observations. As the title of my blog indicates, this is “As I See It.” If I am offensive in anything I say, I apologize. That is not my intent. If I am incorrect in any information, I also apologize. I am not an expert, simply a traveler who visited the country for a few days. I hope you enjoy my views. Each day I will tell you what we did on one or two days of the trip, but I will also give some observations about other topics that span the length of the whole trip. I advise you to start at Day 1 and work your way through. As I go along I will refer back to things I’ve pointed out and discussed on earlier days. Click here for Day 2, Day 3, Day 4, Day 5, Day 6, Day 7, Day 8, Day 9, and Day 10, Days 11 & 12, and Day 13. 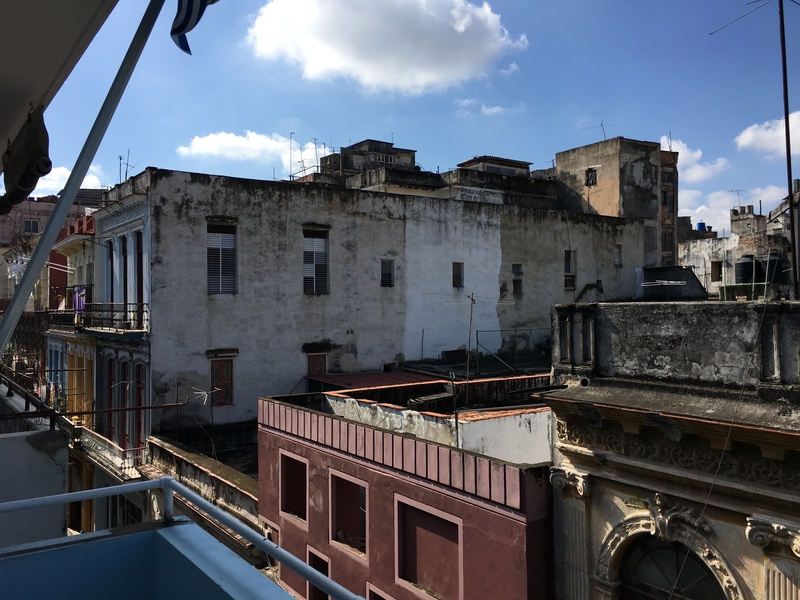 We awoke to realize that our casa had a nice view of the rooftops of Havana. We were on the 3rd floor, but with the height of their ceilings, that was quite high. You can see that some of the buildings were very beautiful and in good repair. Most were not maintained so well. I noticed that they still use a lot of antennae here. On closer inspection you will see that these old buildings are really beautifully ornamented, but they are mostly in very bad disrepair. This is how all of Havana was. The whole place stank of mold and garbage. This was also a common sight. 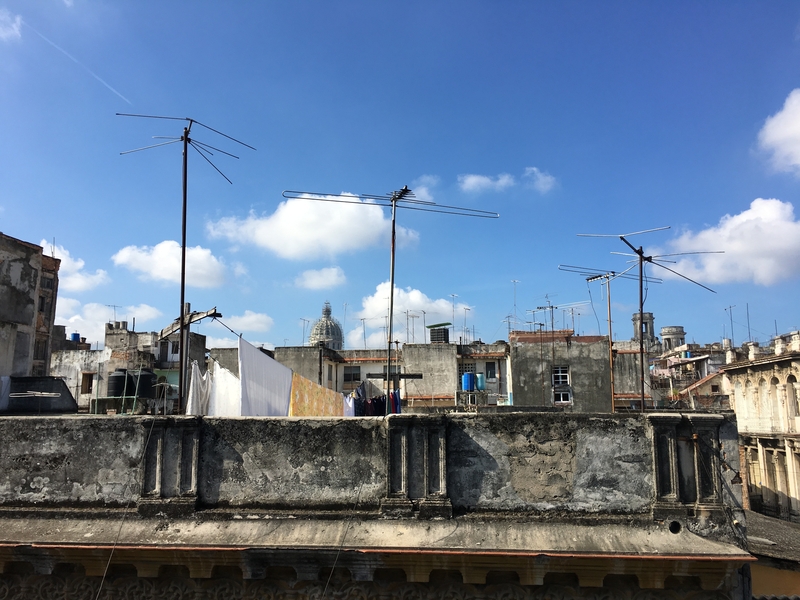 We tried in vain to get free Wi-Fi in a few of the many squares in Havana, but for some reason, it’s harder to get Wi-Fi in Havana, even with a card, than it is in other places. We went to a hotel, paid their exorbitant price for Wi-Fi, and went to get some lunch. Crossing the street in Havana is somewhat like playing Frogger. As often as not, there are no signals telling when to walk and not. Many places there aren’t stop lights even for cars at these very busy intersections. After lunch we went on a classic car tour. 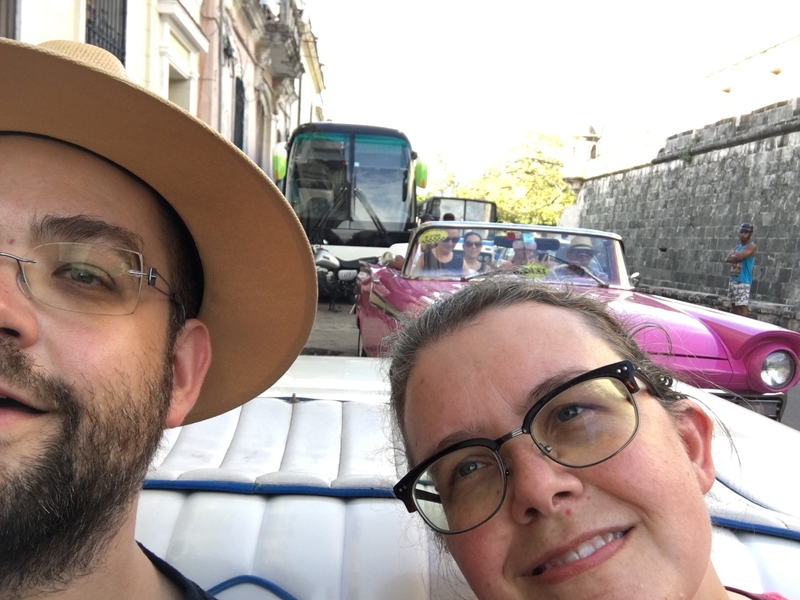 Riding in a 50’s Bel Air, we drove around Old Havana. 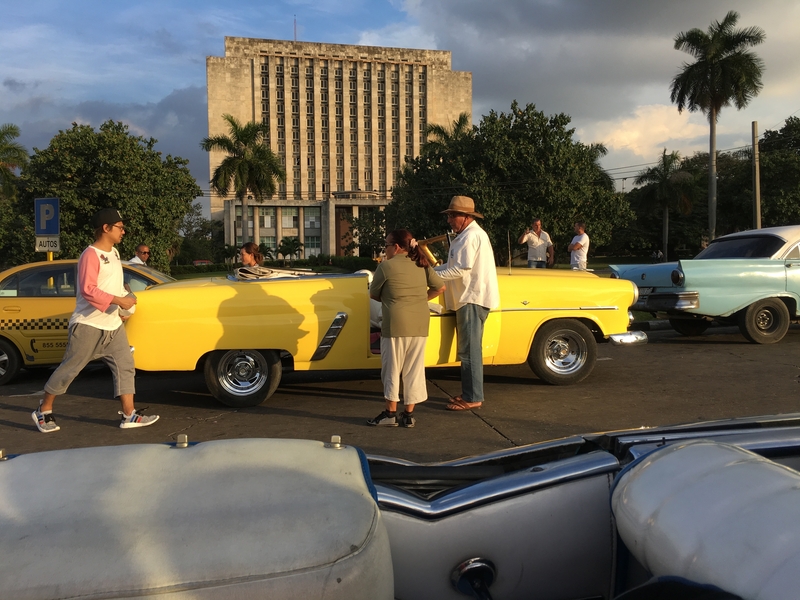 In general, these old American cars are in a lot better shape in Havana than they are in the rest of Cuba. We saw a lot of beautiful classic cars here. We saw the capital building, El Capitolio, currently being renovated. 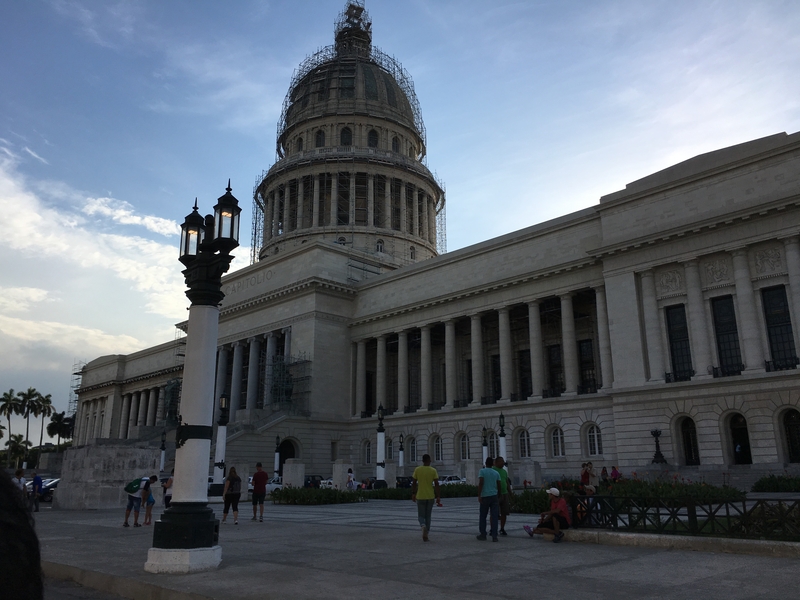 It is built to be a copy of the US Capitol which I’m sure is quite irritating to “the powers that be” in Cuba. We got out at Revolution Plaza where Fidel gave a lot of his looooong speeches. Here is Che Guevara and his famous quote “Hasta la victoria siempre” (Always until victory). 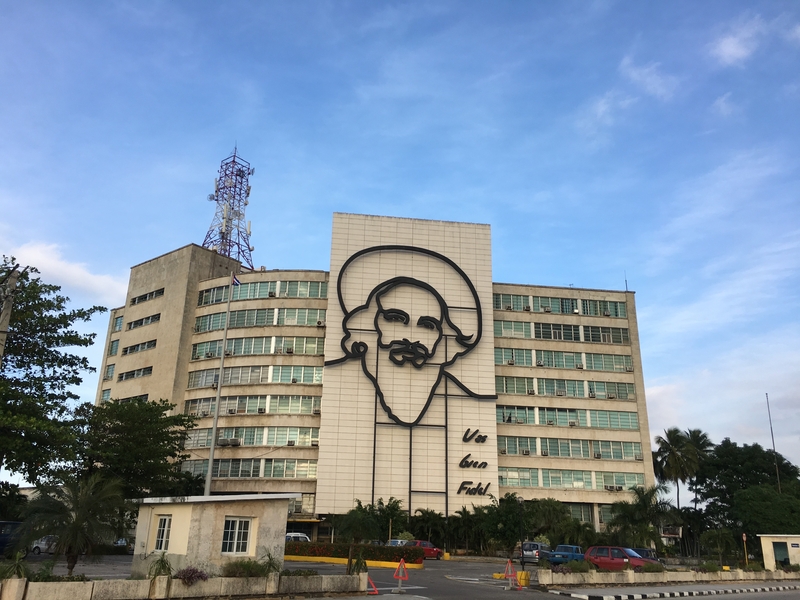 And here is Camillo Cienfuegos with his famous quote “Vas bien Fidel” (You’re doing fine, Fidel). 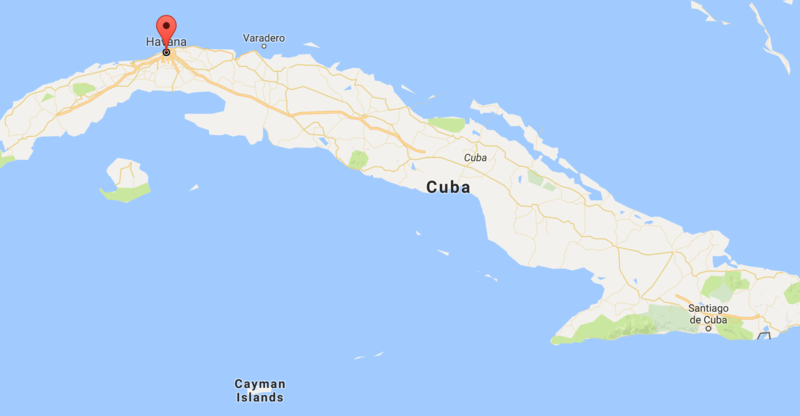 Cienfuegos mysteriously disappeared in an airplane. He was starting to have some conflict with Fidel, and they are still not sure what happened to him. Maybe he secretly came to the US and lived a long and happy life. Whatever the case, the words he said to Fidel during a speech are still used as a stamp of approval to all that was done by The Revolution. 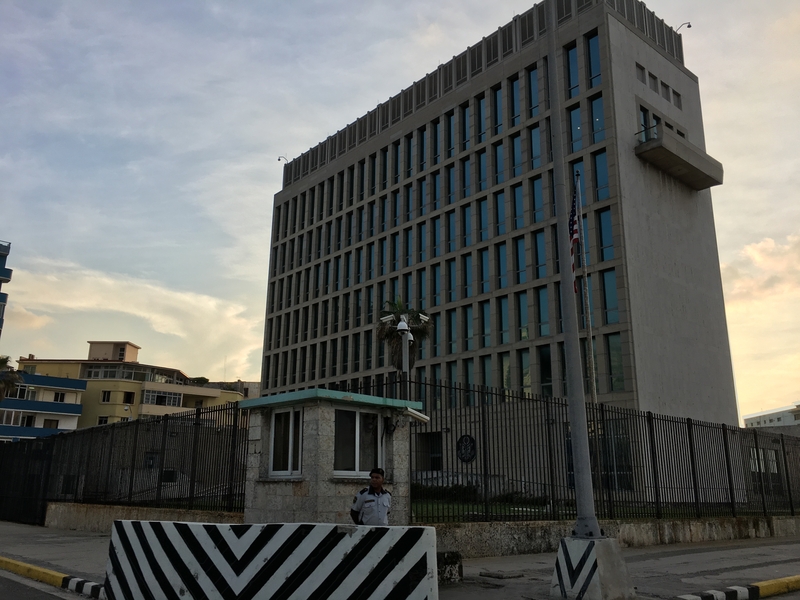 We saw where Raul Castro’s office is, and the building where the Propaganda Department, I mean Ministry of Communications, is. We passed the US Embassy which officially reopened in 2015. It was nice to see Old Glory flying proudly. We passed the Hilton Hotel, or what used to be the Hilton Hotel. 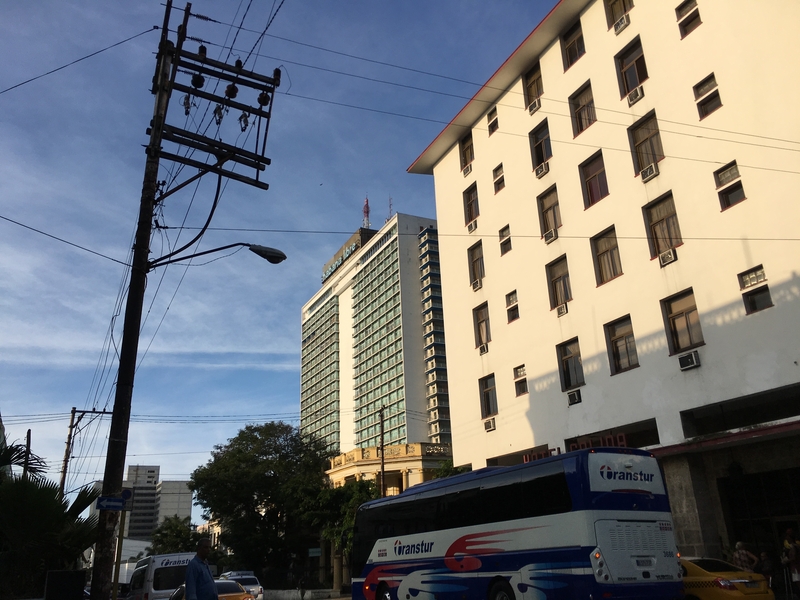 Hilton finished construction in 1958 and the Cuban government took it over and nationalized it in 1959. This, as you can see was a very bad investment. 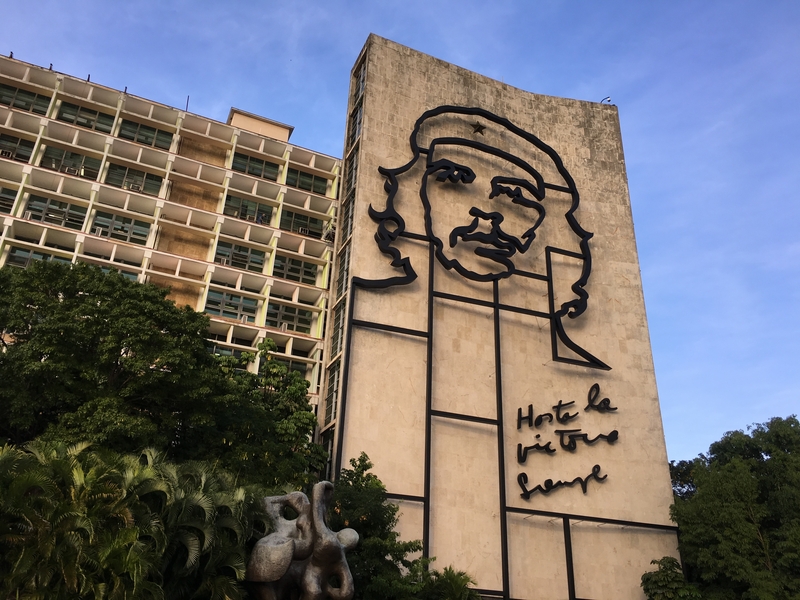 Now it is called the Habana Libre Hotel. 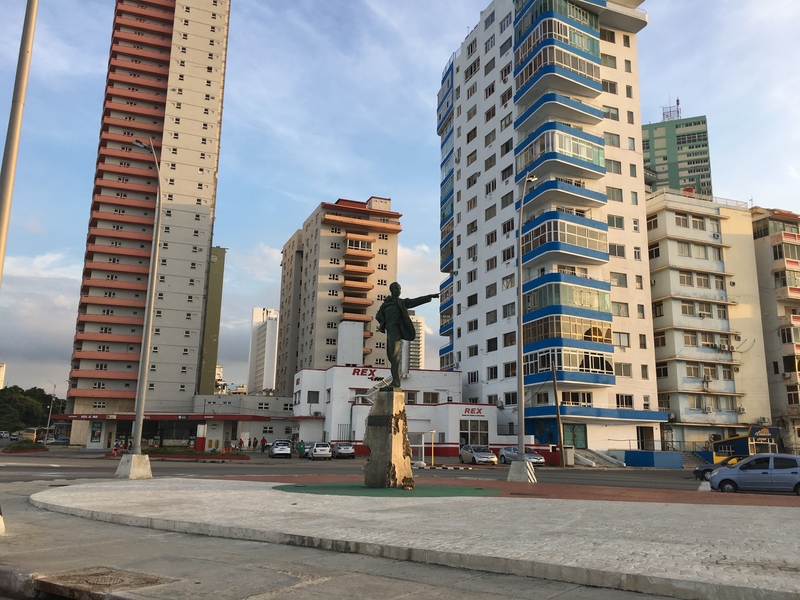 We also passed the José Marti Anti-Imperialist Platform, an area with a statue of José Marti, a national hero who helped free Cuba from the Spanish (there is a José Marti Street in EVERY town we visited, and we flew into the José Marti International Airport in Cuba, and visited the changing of the guard at José Marti’s grave, right next to which Fidel is buried), holding Elian Gonzales and pointing accusingly at the American Embassy. Remember Elian Gonzales? He’s the little boy who was the subject of a custody battle when he was 6 and his mother died in a boat escaping Cuba to Florida with him, and his dad, remaining in Cuba, petitioned to have him returned to Cuba. He is reportedly a student at university there now. There is a sign on his birth home proclaiming that he survived the Cuban-American mafia in Miami. Our tour ended at the Hotel Nacional, a famed hotel with a lot of history involving American celebrities and the mob. There is now no gambling in Cuba (except for over those poor roosters I mentioned before, I guess) but it used to be a big casino. 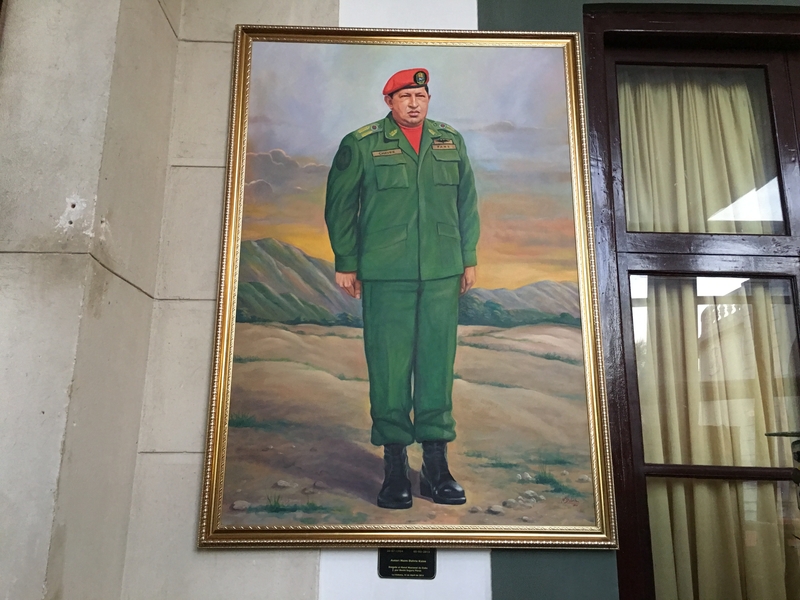 One of the many pictures they had on display was a very large on of Hugo Chavez, former dictator of Venezuela, who they seem to think was a wonderful leader. Reportedly they built Las Vegas because The Revolution ruined their plans for gambling in Havana. 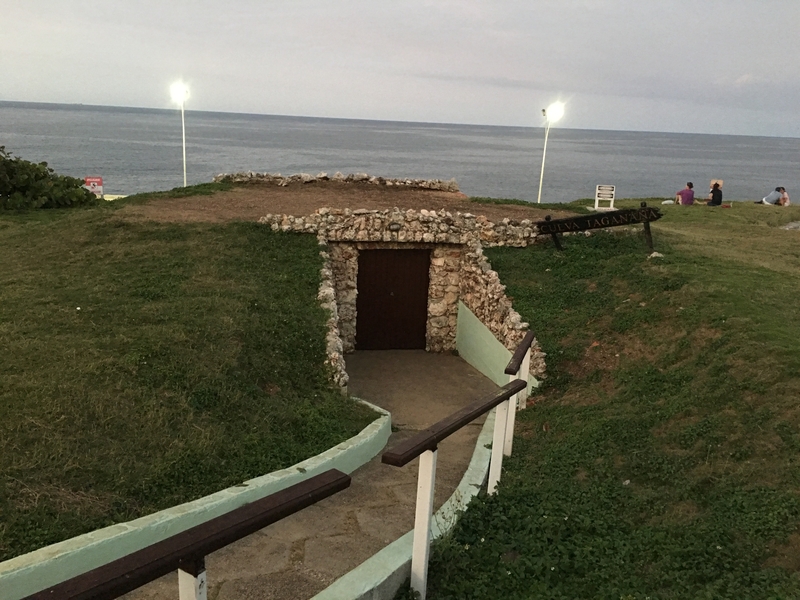 This Hotel Nacional was also the headquarters of operations during the Cuban Missile Crisis and they still have trenches on exhibit from those days. They also have on display two of the biggest cannons I’ve ever seen. They are from the period when the Spanish were defending the island from attack. 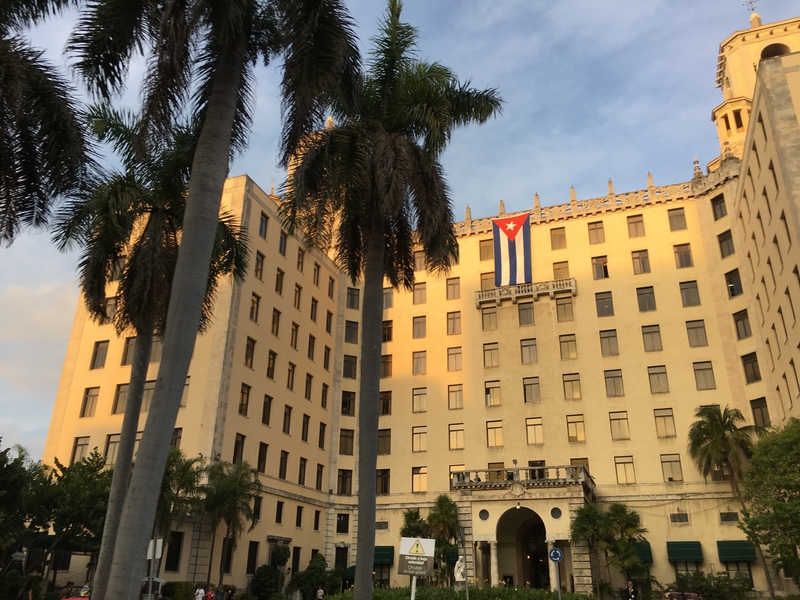 This hotel is absolutely beautiful, but it is still dealing with issues similar to the rest of Cuba; I went in the bathroom which was clean, but there were no paper towels. They did, however, have a roll of toilet paper in a dispenser there by the sink to dry my hands on, which was strange. We caught a classic car taxi back to another plaza where there also was not Wi-Fi. 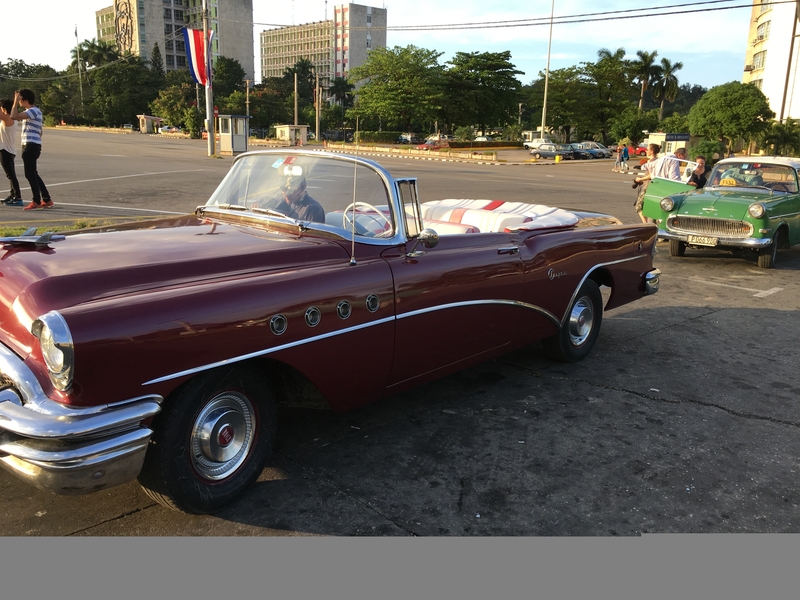 In Havana the old American cars, at least a lot of them, are in good shape. Some of them are downright beautiful. A lot of them are being used as taxis, and the convertibles are being used for the classic car tours like we took. 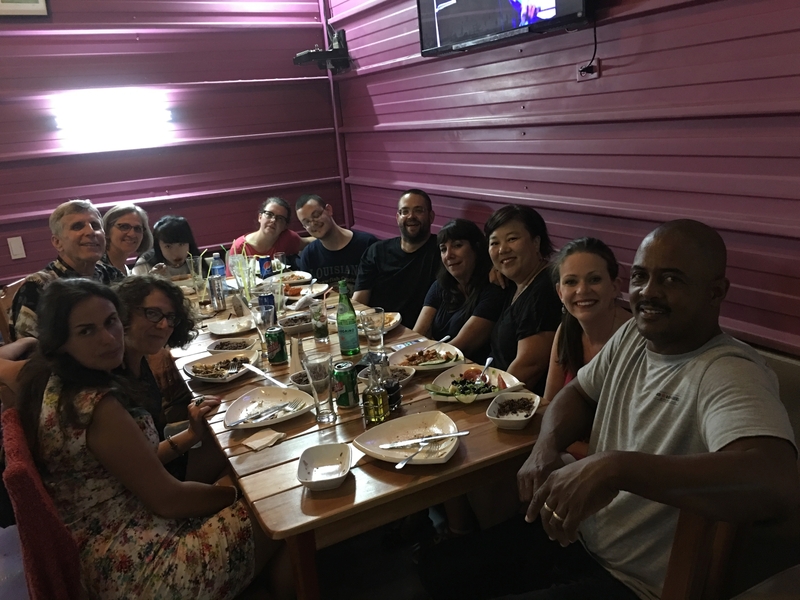 That evening we had one last dinner with our group. I finally ordered a Cuban Sandwich. I had seen only 2 different menus with a Cubano sandwich, but one of them was out of bread. 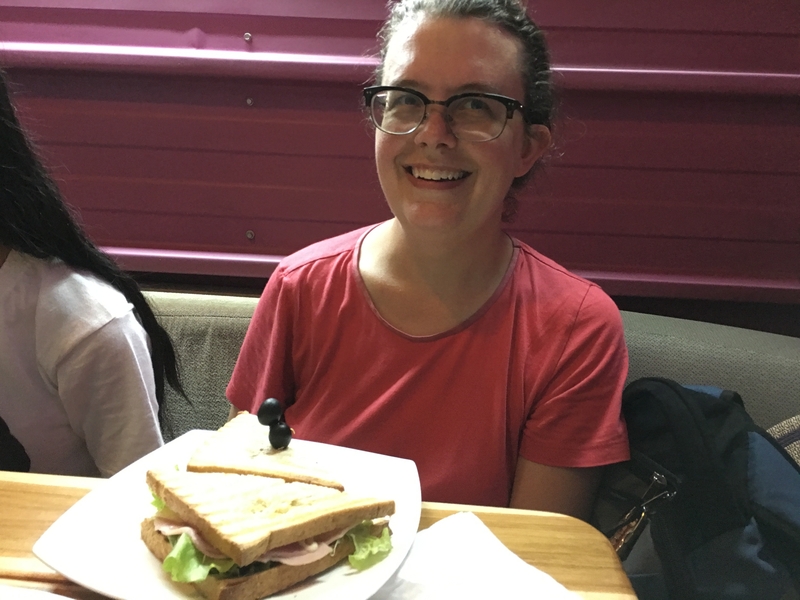 The sandwich was cheese, ham, and roast pork with mayonnaise on toasted bread. It wasn’t all that good compared to the great food we’d been eating for 2 weeks now. 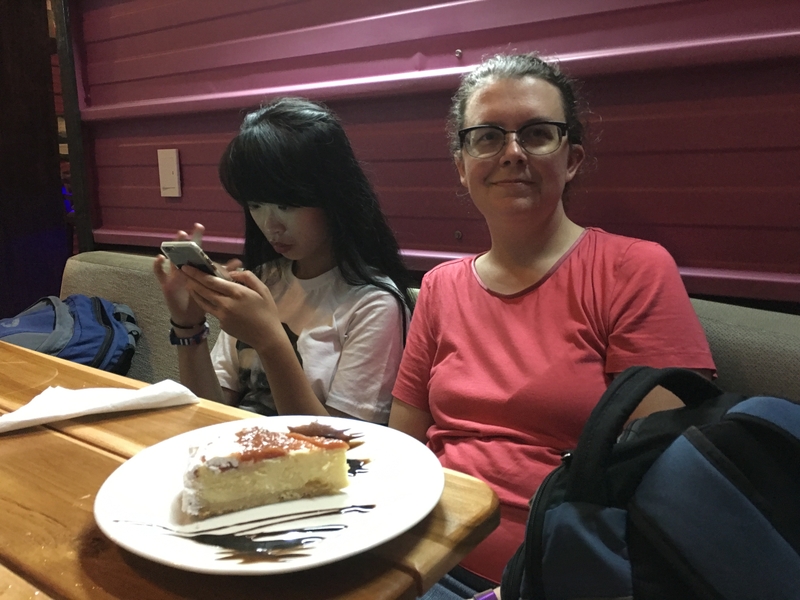 I also tried cheesecake which was an insult to cheesecakes everywhere. It tasted more like sugarless custard with guava jelly on top. We then attended a musical performance by the Buena Vista Social Club. It was a very high quality performance with great percussionists, but we were so sick of hearing the same 5 songs over and over again that it was kind of hard to enjoy. 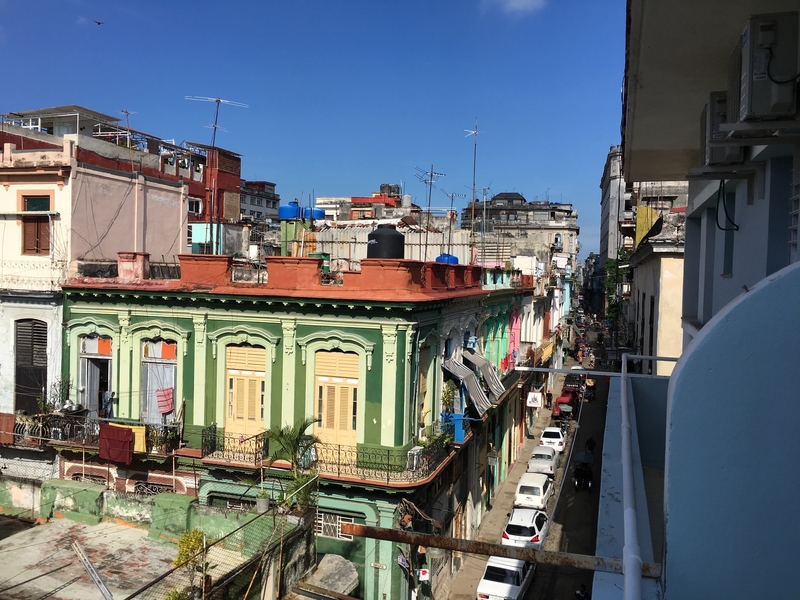 Havana is very different than the rest of Cuba. That’s like saying New York City is very different than rural Iowa. Here the hotels are nice, plush even, even though they are all old. The others we saw throughout Cuba, even the nicest ones, were more along the lines of a Red Roof Inn except with better views. Everything was also more expensive in Havana. 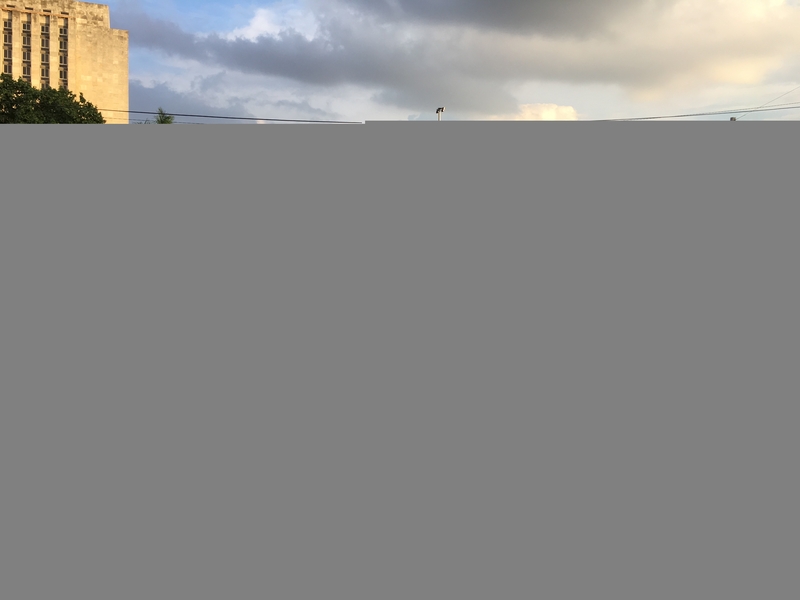 There are a lot more tourists there, many of whom have absolutely no desire or plans to see the rest of Cuba. They are there for the rum and the beaches. 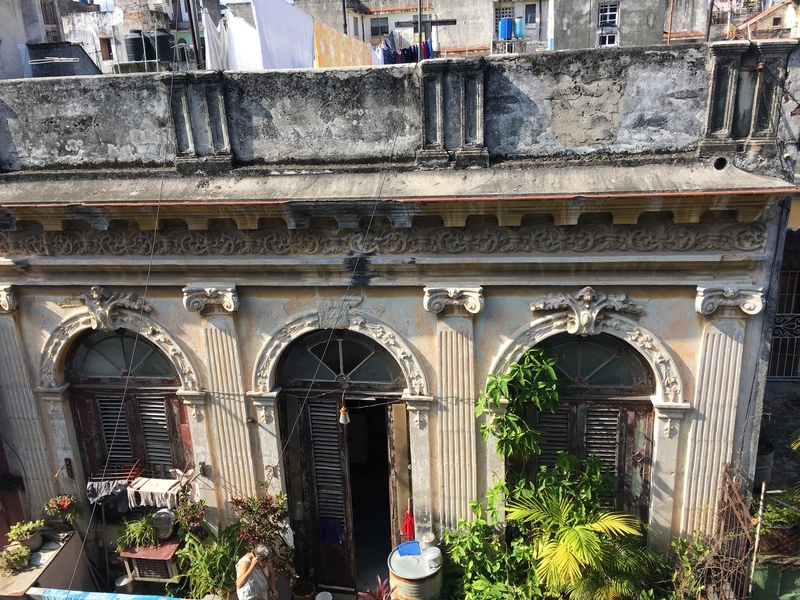 In Havana there is amazing beauty next to horrible desolation and decay. The whole city (except the nice hotels) stinks of mildew, car exhaust, and unemptied trash bins. On the way home from the musical show we saw about 6 cats gathered around one set of trash bins and dogs were equally wandering the streets. We went to our casa for one last night in a foam Cuban bed. We were very much ready to go home. We awoke, very anxious to be on our way. We shared a taxi to airport with one of the ladies from our group. Near the airport is this sign. This is referring to the American embargo, or blockade. 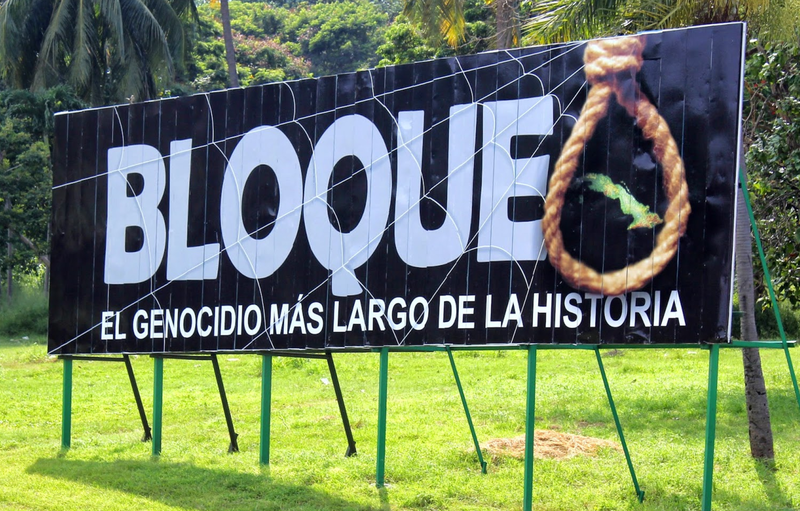 This sign calls it the “longest genocide in history.” I’m not sure how the embargo is a genocide, but that’s what the Cuban government says, anyway. We got our luggage wrapped to prevent theft. Their TV’s in the airport were playing a celebration of Cuban athletes at the 2016 Olympics. Every Cuban Olympian was featured whether or not they won any medals. When we checked in they offered us an upgrade to first class for very cheap so we took it. Just so you know, first class on Cuban Air consists of bigger, more comfortable seats, a cloth napkin, and 4 finger sandwiches. Oh, and a few choices of drinks, but still no Pepsi or Coke. After journeying for 15 days in Cuba I haven’t at all figured out the Cuban version of communism. There are still very much the haves and have-nots. There is a ton of propaganda and control of access to information. Everything goes through a filter and comes out with a different spin on it. 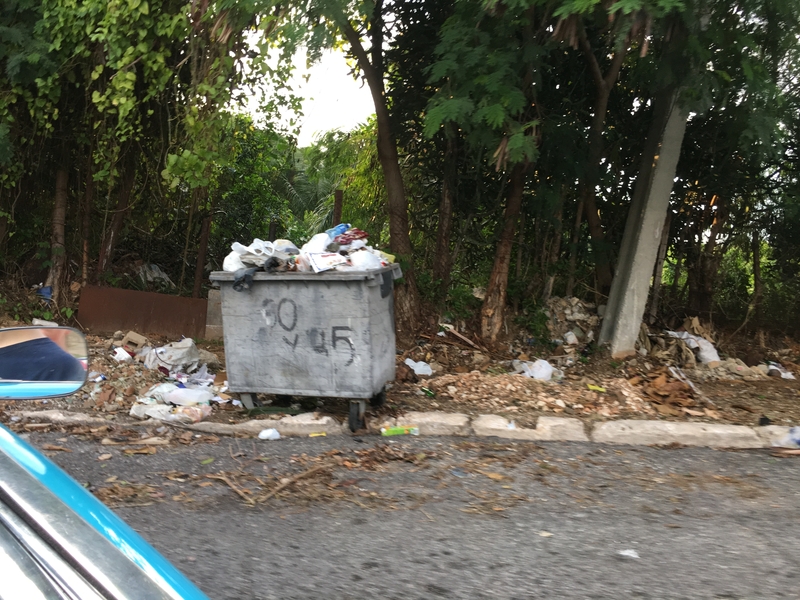 Cubans say they are allowed to be critical of the government but yet there are times when they will say they can’t talk about certain topics such as national heroes or the communist party. They still use a lot of nonverbal communications: sign language, whistles, facial expressions, talking with their eyes, and the list goes on. 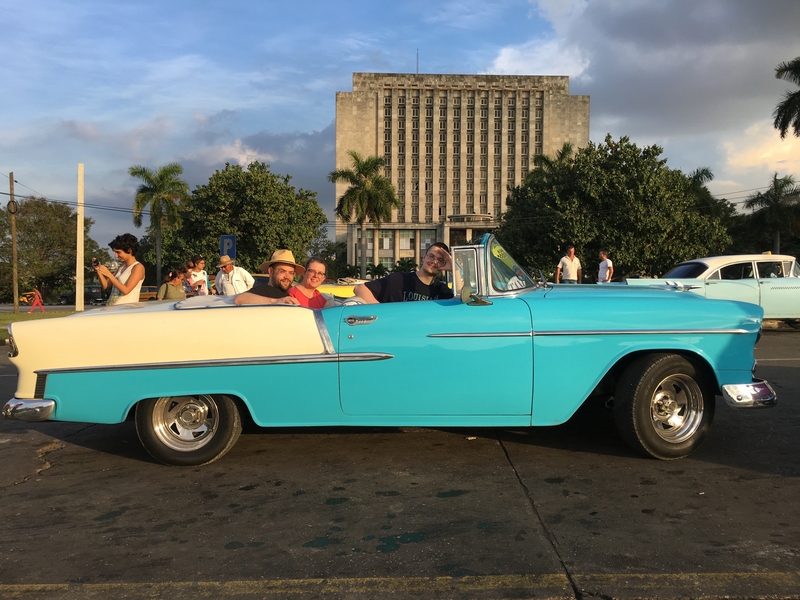 I can’t really say we enjoyed our time in Cuba. It really was quite rough, and staying in the casas as we did, there was no way to get a reprieve from the roughness. The people were friendly and helpful, and the landscapes were stunning. The infrastructure was crumbling and the resources were spotty. The best way I know to describe the country is as a paradox: the beauty of the landscapes contrasted with the reality of scarce resources, the beautiful old ornate architecture in a state of disrepair, the message that The Revolution is wonderful next to the reality of its restrictions, the propaganda that America is evil contradicted by the friendliness of the Cuban people toward Americans. 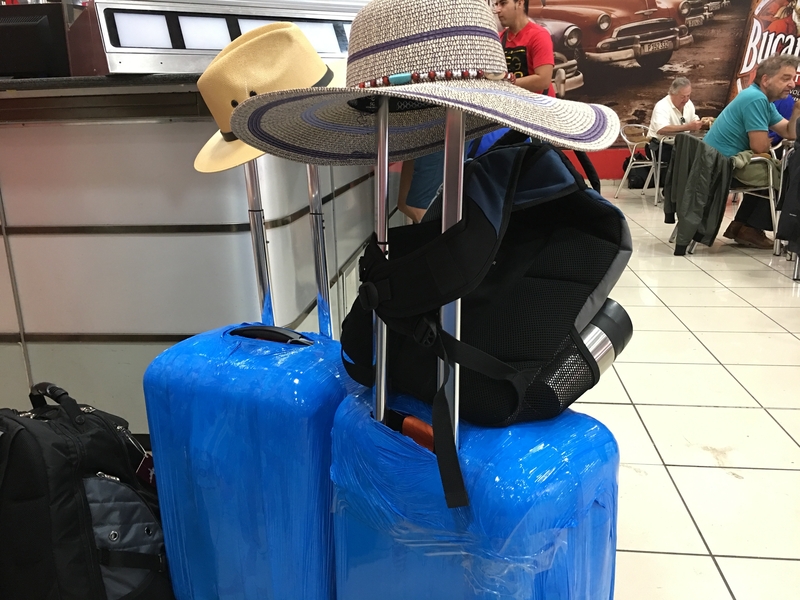 The reason for our trip was dual: 1) to immerse Vince in Spanish as much as possible to teach him the language better and give him more confidence and 2) to see a view through a closing window into a rapidly changing culture. Both of those things were successes. I hope you’ve enjoyed Cuba As I See It. I read your whole journey to Cuba! I enjoyed your take on things through American eyes. The bathroom rating system was a RIOT, but REAL! Lol. I was intrigued by your bold choice to visit there. As a Venezuelan who came to Philly at the age on 9, and visited again (with Steve) about 3 times as an adult, before the present economic & political crisis set in, I totally get your take on the propaganda and the paradox that you feel Cuba is. I had similar feelings when I went back to Venezuela while the late Hugo Chavez was in power. There are beautiful people there, (I was able to spend time with my very 1st pastor and his family), but there are such limitations. I am thankful for my roots, but really appreciate the freedoms & comforts of the U.S.